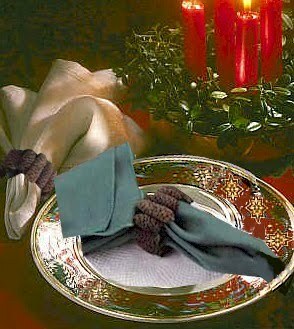 Conceal the napkin ring by wrapping it with brown ribbon. Glue both ends of the ribbon to the ring to hold it in place. Let it dry. Place a dab of glue to the back of a birch cone and attach it vertically to the ring. Continue gluing the cones vertically, side by side, until the ring is covered. Allow it to dry completely before using. Now how easy was that?! You could probably also substitute the pine cones with fall inspired items for Thanksgiving. Have fun creating!